FLNG Market size for 2016 was valued over USD 10 billion and is set to exceed 300 MTPA by 2024. Growing demand for clean fuel coupled with increasing focus towards energy mix will drive the global FLNG market size. Rapid fossil fuel depletion along with growing measures to reduce carbon emissions will stimulate the industry growth. According to the International Energy Agency, global natural gas demand increased by 1.4% in 2015 from 2014. Ability to accelerate the procurement of natural gas will make product adoption favorable. Rising adoption of natural gas-fired power plants will embellish the FLNG market share. In 2017, Wison Offshore & Marine developed an integrated floating LNG power plant capable of regasification, LNG storage & loading facilities, and power generation in a single unit. In 2017, the government of Indonesia introduced a program to build gas-fired power plants and LNG import infrastructure to meet their electrification targets. The country aims to increase the total capacity to 35,000MW by 2019, primarily from natural gas fueled power stations. Abundant availability of natural gas reserves in offshore region will stimulate the FLNG market growth. In 2017, Kosmos Energy discovered over 15 TCF of natural gas in Senegal offshore. Growing demand for cost-effective technology to monetize stranded and associated gas reserves will further complement the industry growth. FSRU market in 2016 was valued over 90 MTPA. Fast track implementation, lower investment cost and enhanced flexibility are some of the factors which will positively influence the industry growth. It finds its wide applications across various countries lacking domestic energy reserves. In 2016, Colombia and Ghana added FSRU units, to be followed by Uruguay, Bangladesh, and Puerto Rico in 2017 and Chile in 2018. Growing demand for natural gas, primarily across Asia pacific will stimulate the LNG FPSO market share. In 2016, the Asia Pacific natural gas consumption increased by over 4.9% from 2010.Vessel ability to relocate from one place to another, cost efficiency relative to onshore liquefaction plants and adaptability to operate in any well depth are some of the features which may propel the business growth. These vessels can be employed for exploitation, storage, recovery, transportation and end-use applications of offshore associated-gas resources and marginal gas fields. Small/Mid-Scale FLNG market size is predicted to expand over 30% by 2024. Short development schedule and low capital cost makes its adoption preferable over other alternates. It finds wide applications in stranded gas reserves which are economically unviable to produce through other means. Increasing government focus towards development of floating import units and infrastructure to build reliable energy sector will propel industry landscape. Growing demand for cost efficient and flexible LNG distribution solutions will further complement the business growth. Escalating demand for floating vessels to eliminate the deployment of extensive gas pipelines to onshore facilities will positively influence the large scale FLNG market share. Ability to relocate to new fields upon the depletion of original field will further complement the industry landscape. Mozambique FLNG market size was valued over USD 5 billion in 2016. Increasing number of floating LNG projects along with favorable government initiatives including financial assistance to encourage the development of stranded gas reserves will propel the industry landscape. In 2017, the Mozambican government announced to sponsor the Coral FLNG infrastructure project of 3.4 MTPA in the Rovuma basin which is anticipated to commence commercial operations in 2022. Turkey FLNG market size is set to grow over 18% by 2024. Rising concern to maintain energy security and to diversify its gas sources will positively influence the industry growth. In 2016, Turkey invested USD100 million to commission its first FSRU, with an objective of expanding energy mix in the country. Ongoing investments toward research and development to efficiently unlock and develop difficult offshore gas fields will stimulate the Australia FLNG market share. In 2013, Royal Dutch Shell has invested over USD 12 billion to build 3.6 MTPA floating LNG unit to produce natural gas quickly and cost effectively. The LNG vessel is scheduled to start commercial production in 2018. Chile FLNG market will grow owing to increased sanctioning of floating import projects. Growing demand for LNG import terminals to increase the competitiveness and reliability of the natural gas will further complement the business landscape. 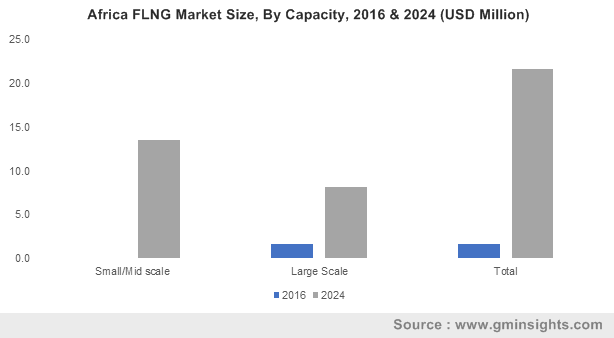 Key participants in FLNG market includes Golar LNG, Höegh LNG, Excelerate Energy, Exmar, Eni, Ophir Energy, Mitsui O.S.K. Lines, Royal Dutch Shell, Petronas, Noble Energy, Woodside Petroleum. Major shipbuilders catering the industry include Samsung Heavy Industries, DSME and Associates, Hyundai Heavy Industries and Mitsubishi Heavy Industries. Floating LNG refers to an offshore floating vessel designed to enable the development of offshore natural gas resources. It offers a feasible and environmental solution and can be redeployed or relocated. FLNG can act as a processing platform and liquefaction facility, eliminating the prohibitive cost of pipelines, production facilities and site preparation. The vessels can be used for short or extended periods and can be owned or leased, as opposed to onshore terminals which are constructed for decades of use. Excessive cost of onshore development terminals and restriction to long term facilities will augment the FLNG market size.